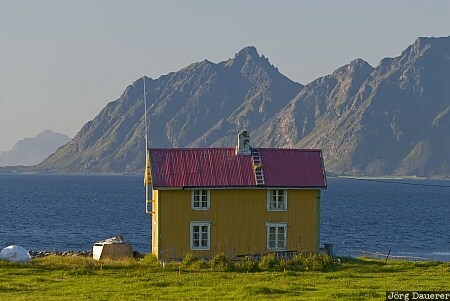 A yellow house in a green meadow near Sanden with steep mountains of Austvågøy in the background. Sanden is on Austvågøy, an island of the Lofoten archipelago in Nordland, Norway. This photo was taken in the evening of a sunny day in August of 2010. This photo is part of the exhibition The color Yellow (June 2013). This photo was taken with a digital camera.